There is concern that sediment and nutrient exported from grazing lands are having a detrimental effect on the Great Barrier Reef World Heritage Area. CSIRO Land and Water have been monitoring the effect of grazing land management on sediment and nutrient export from Weany Creek since 1999. Weany Creek is located on Virginia Park Station near Charters Towers in Queensland, Australia. The catchment area of 13.5 km2 has been used for cattle grazing for many decades. Figure 2: A large cut-throat flume monitoring runoff and suspended sediment from a hillslope in the Weany Creek catchment. Gully and stream bank erosion was measured using a combination of erosion pins (figure 3), scour chains and topographic survey. An automated stream gauge was installed to measure water height, velocity and turbidity. The system collects 24 one litre samples across an entire hydrograph. 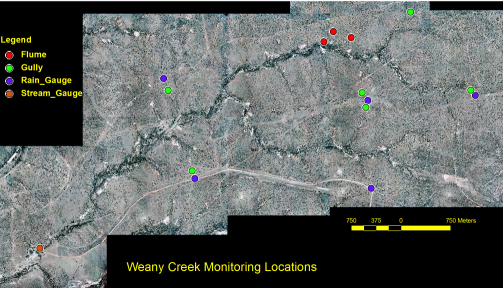 Figure 1: Monitoring locations within the Weany Creek catchment. 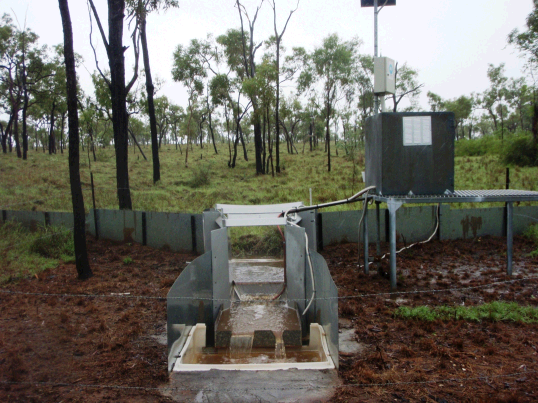 A range of field methods have been used to measure erosion and runoff from the Weany Creek catchment. (figure 1). These were targeted at specific processes and scales across hillslopes, gullies, stream banks and the catchment as a whole. Hillslope hydrology was measured using cut-throat flumes (figure 2) that also collect water samples. Erosion was measured using arrays of erosion pins, LFA transects and bed load traps. 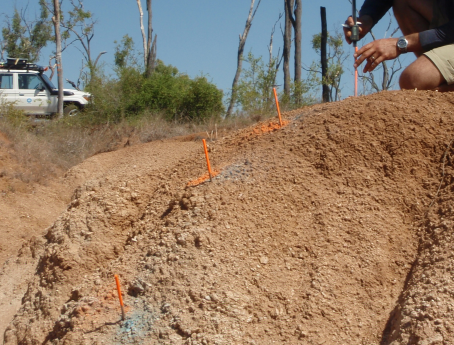 Figure 3: Gully wall erosion being monitored with erosion pins. Measurements were made with digital calipers. A sediment budget (figure 4) has been developed for Weany Creek that highlights the dominant erosion processes. End of catchment sediment yields have increased through time even though grazing land management has reduced hillslope sediment yields by up to 70%. Water quality sample analysis shows that most nutrients are bound to soil particles . Figure 4: (Left) A sediment budget constructed for Weany Creek. (Right) Sediment yield and runoff measured at the Weany Creek gauge.